The saying “a little bit goes a long way” is ringing true for many of our customers just like you. In fact, our customers have realized significant savings – to the tune of $2 billion! – by making more informed choices about their energy usage. There are many easy ways to cut down on your energy consumption. Through one of the nation’s largest energy efficiency programs, ComEd offers more than 40 options to help you reduce your energy usage, like installing a smart thermostat in your home, recycling your old fridge or participating in an assessment for your home or business.. Together these efforts add up to meaningful savings. 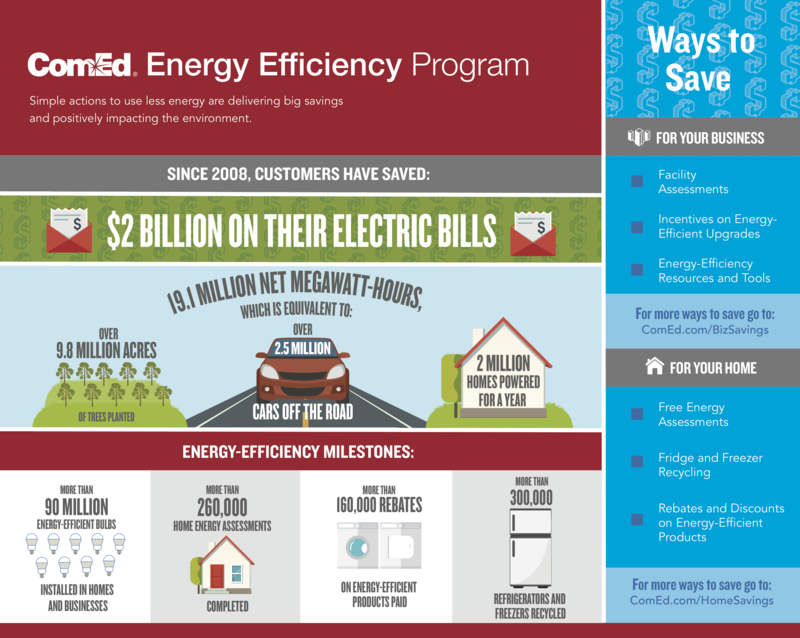 Find out how you can benefit from the ComEd Energy Efficiency Program by visiting ComEd.com/WaysToSave. Energy Efficiency programs are funded by ComEd customers in compliance with Illinois law.